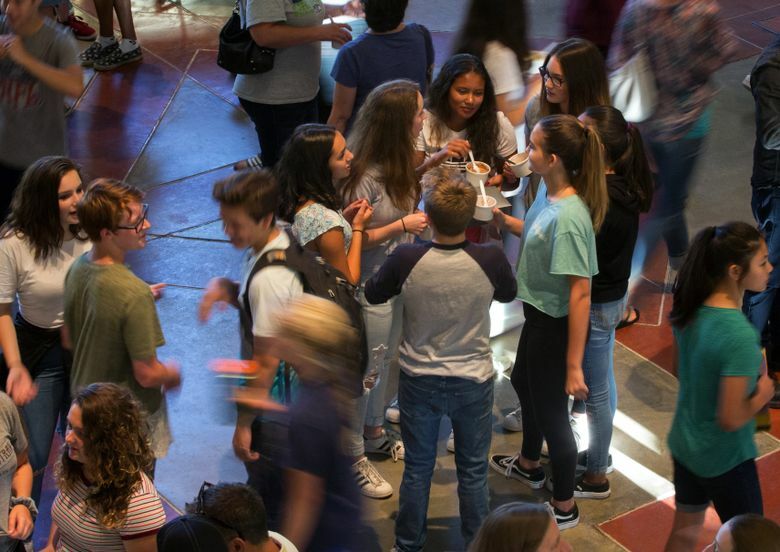 As research increasingly shows that ninth grade is a make-or-break year, educators around Puget Sound are reinventing the freshman experience to help all students early and often. On a sunny Saturday morning just before school let out for the summer, more than 100 students crammed into the library at West Seattle High and — over four tense hours — rushed to make up overdue assignments and retake tests. Many of the students arrived in pajamas. They bristled at any interruption, and left a generous spread of breakfast food mostly untouched. For some, this was the second of three consecutive Saturdays they spent in the library as part of a catch-up frenzy before teachers closed their grade books for the semester. And these weekend study halls — typically offered just once a month — capped a yearlong effort aimed at preventing any of the Seattle school’s 274 freshmen from failing even one class. Across Washington state, roughly 1 in 5 ninth-graders failed at least one core course in the 2015-16 school year. And across the Puget Sound region, freshman failure rates ranged from as little as 4 percent on Mercer Island to a high of 38 percent in Clover Park and Tukwila. Traditionally, high schools offer studentsa sink-or-swim scenario: Those with poor grades are expected to catch up on their own through repeat classes, summer school or online courses. On Monday morning, Sept. 4, Seattle Times reporter Neal Morton will talk about freshman-support programs with KNKX’s Ariel Van Cleave. Tune in at 5:44 a.m., 7:44 a.m. or listen at http://knkx.org/post/how-some-washington-high-schools-provide-extra-attention-freshmen. But a growing body of research suggests the grades students earn in their freshman year are a strong predictor of whether they’ll ever graduate — stronger than their test scores or even family income. That’s why schools like West Seattle are paying more attention to their first-year students, and offering them more support earlier. The school starts by identifying the incoming students who struggled academically in eighth grade. On average, Whiton places about 60 freshmen each fall into a small cohort that is tracked closely all year long, starting with a special orientation and ending with the last-minute study halls. The attention “really keeps you motivated,” said Dustin Jones Jr., who recently graduated. He said he spent the first half of his freshman year ditching class to roam the hallways and waste time with friends. How a tutor at West Seattle High School found that bolstering her students’ self worth is key to helping them succeed. “They started helping me, got me on track to graduate on time,” said Jones, who among a group of friends acted reserved but spoke with confidence. “Every week, they’re on top of your grades, checking what you’re missing, making sure you’re in class. The hope is that West Seattle High will see the kind of success that’s occurred 40 miles south at Washington High in Tacoma. Previously deemed a “dropout factory,” that school made a campuswide shift in 2006 to focus on freshmen. That eventually helped boost its on-time graduation rate from 61 percent in 2009 to 87 percent last year. Educators have long had a name for what happens to high-school freshmen who get lost in the crowd at a time when they’re experiencing an increase in freedom and responsibility, plus new social pressures. Now, research is bolstering calls to retool that freshman experience. “We have to treat every student as if they’re at risk — because the studies show that they are,” said Whiton, who stayed up all night to get ready for the second-to-last Saturday study hall. In 2010, for example, a report published in the journal Education showed that ninth-graders, compared with their older classmates, have the lowest grade-point averages, the most missed classes, the majority of failing grades and more referrals for misbehavior. While any of those challenges alone might lead students to drop out, a landmark study convinced many educators that course failure matters most. In 2005, researchers from the University of Chicago examined the records of thousands of students who entered Chicago public high schools in 1999. They found that 81 percent of students who completed the ninth grade without failing a course ended up graduating four years later. For students who failed one or more classes, the on-time graduation rate plummeted to 22 percent. “It might seem obvious that students who do well in school their freshman year continue to do well throughout high school up to graduation,” the study’s authors wrote. But, they added, the importance of how well students do in their classes is often overlooked as federal and state education laws place a priority on test scores. A year after that study was published, Washington High became one of the first schools in this region to overhaul its ninth-grade year. School administrators first sifted through student records and identified incomplete coursework as the primary reason their ninth-graders failed classes. So teachers started sending students with slipping grades to a midday study hall every Tuesday and Friday to make up missing assignments. Some teachers initially bristled at the idea of struggling students missing class, Hester said. But they soon saw the value of making students finish their work. Students who don’t complete it during the study hall are given a sack lunch so they can eat and continue working. Teachers at Washington High also revamped their grading policy: Students must show they’ve mastered a subject before earning credit. And students can’t participate in sports and other activities if they don’t keep their grades up, which has helped Amir Ames, a cadet in the high school’s ROTC program. Ames, who just finished his sophomore year, didn’t have to attend the midday study halls this past school year, but often showed up anyway. “It’s a helping hand, to be honest,” Ames said. “You have this backup plan if you are a kid who has a lot going at home. His fellow ROTC cadets, he added, feel like a family — which in turn motivates him to do whatever it takes to stay in the program. 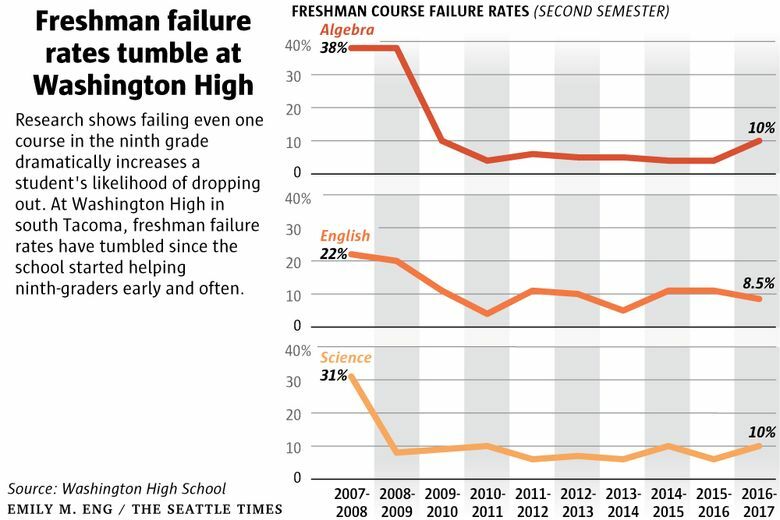 After a decade of these efforts, Washington High’s passing rates in English, math and science have all improved — in algebra, for example, just 4 percent of freshmen failed that course last year, down from 38 percent in 2008. That’s helped the graduation rate rise — driven largely by students of color, particularly black students, 97 percent of whom graduated on time in 2016. That’s the opposite of what happens at most high schools, where students of color, on average, graduate at lower rates than their white peers. In Seattle, city officials are focusing freshman-support efforts at five high schools — Cleveland, Franklin, Ingraham, Interagency Academy and West Seattle. Each has paid for those efforts with help from the city’s $235 million Family and Education levy. So far, West Seattle High has spent nearly $1.4 million on its ninth-grade interventions — to hire tutors, a ninth-grade counselor, a graduation coordinator and an on-site drug and alcohol counselor. “It gives us some flexibility to get these kids exactly what they need,” Whiton said. Freshmen on the verge of flunking a core course must attend after-school study halls, and teachers send struggling students to tutors for small-group lessons. Every freshman also is assigned an upper-class mentor. For students who remain behind, teachers prepare packets of assignments and tests for them to complete at the monthly Saturday sessions. To those who worry that teachers are coddling students too much, robbing them of important lessons in personal responsibility, West Seattle educators point to the results, such as higher scores on state tests. “Sometimes a student just needs more time (or) a second chance,” said math department chair Kim Depew. When Whiton joined West Seattle High’s staff, 83 percent of freshmen advanced to the 10th grade on time. Last year, it was 92 percent, according to the city. Freshmen are getting better grades, too. Among the four comprehensive high schools that are focusing on freshman, the share of ninth-graders earning a C or better in all their core classes rose from 65 percent in the first semester of 2013-14 to 78 percent last fall. All other Seattle high schools posted a more modest gain from 73 percent in 2013-14 to 76 percent this year. Still, there’s room for improvement: For the first time last year, the city looked at whether the levy-funded schools have significant gaps when to comes to race. And it found they did, with students who are black and Latino, on average, lagging behind students who are white and Asian. At West Seattle High, for example, 87 percent of white and Asian students earned a C or better in their core classes last fall. All other students of color? Just 55 percent. 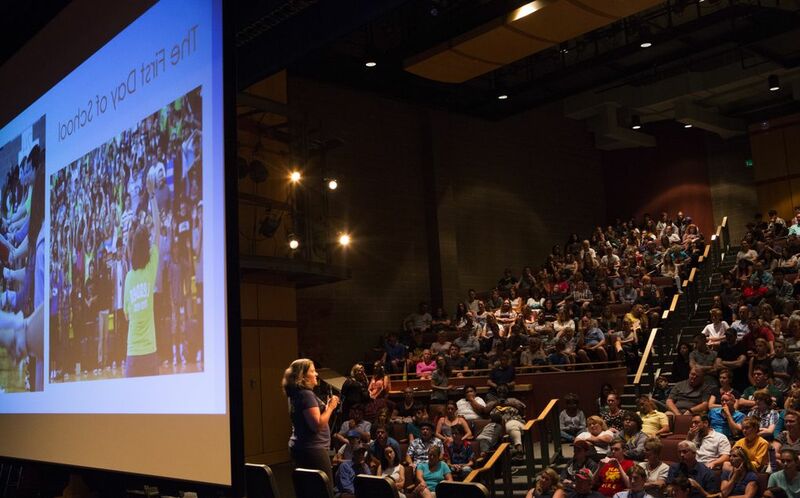 Beyond Seattle, the state is encouraging all schools to focus more on freshman success. 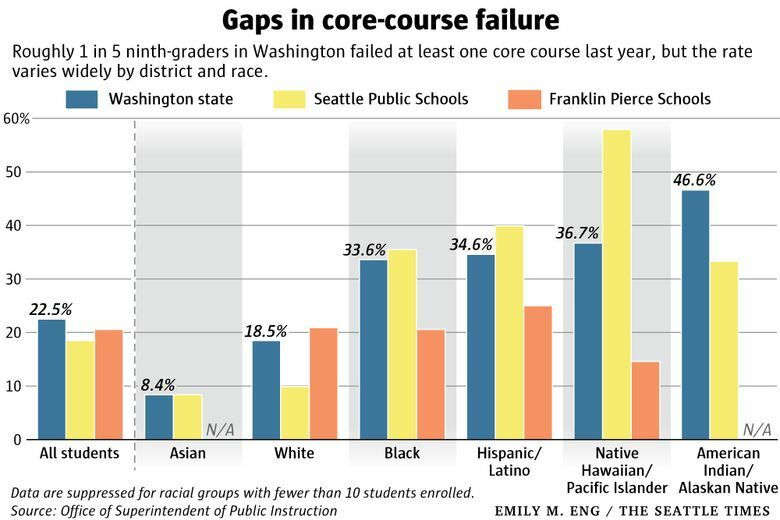 As part of that, the Office of Superintendent of Public Instruction this year, for the first time, released data on freshman course-failure rates for all 295 districts in Washington. State school Superintendent Chris Reykdal has included freshman failure rates as one measure of school success under the federal government’s main education law, the Every Student Succeeds Act. His office plans to release school-by-school data next year. Back at West Seattle High, on the morning of the penultimate Saturday study hall, Whiton’s desk was littered with a collection of extra large — and empty — paper and ceramic coffee cups. After her all-nighter preparing for the day, Whiton jokingly blamed her exhaustion for the tears that filled her eyes as she listened to Jones and his friend, Yusuf Mohamed — two seniors who praised her team for helping them make it to graduation. “It’s a labor of love,” Whiton said, beaming. Towering over his friends in the school library, Mohamed spoke as enthusiastically about the West Seattle program as he did about his favorite game of basketball. He said his mother arranged for him to transfer to West Seattle after he struggled academically at another school. And he had difficulties at West Seattle, too, until Whiton’s team stepped in, helping him build better time-management skills and habits. “I started feeling comfortable. I was smiling in the hallways and stuff. I felt confident,” he said. He’s now headed to prep school for a year to raise his grade-point average (GPA) so he can play basketball at the University of Washington, which is recruiting him.